The piece demonstrates the advancement of military technology which actually towers over armed troops in power during the First World War. The heavy use of both black and red represents the evil and bloodshed that happened especially during the First World War. 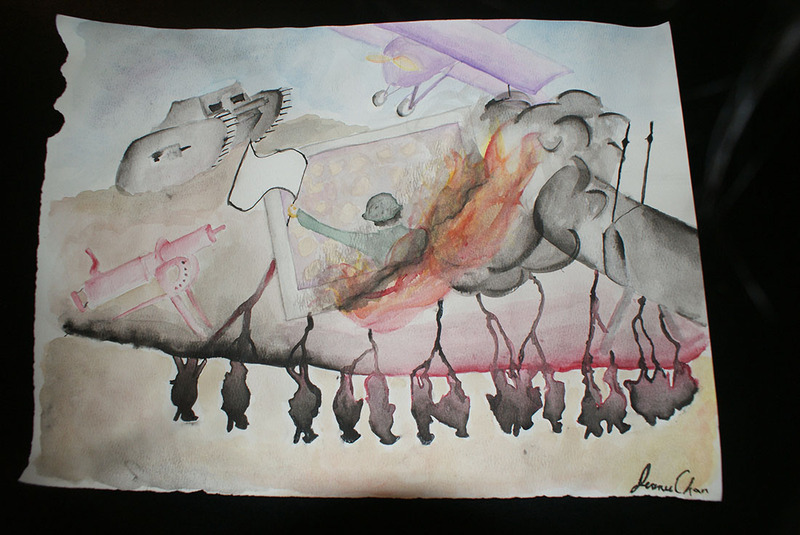 Yet the light contrast of watercolour depict the opinions of the people during this time as they never experienced war before and do not know the serious consequences that follow. Along with the many developing inventions, both military inventions grow to be increasingly more scarier and terrifying than man himself. The piece is depicting the imbalance of machine versus man as the machine is the one winning and pulling countries to victory. They stand above human power and start to dominate in many battles held during the 5 years of the war. The time of the First World War was truly a battle between machine and man.